Football highlights between Stratford and Weston in Weston, Conn. on Saturday November 6, 2010. Weston QB #15 Joey Falci looses the ball as he is tackled by Stratford. Stratford recovered the ball. Football highlights between Stratford and Weston in Weston, Conn. on Saturday November 6, 2010. Weston QB #15 Joey Falci tries to recover a loose ball. Stratford's QB Markey Desruisseaux, left, carries the ball, during football action against Weston in Weston, Conn. on Saturday November 6, 2010. Football highlights between Stratford and Weston in Weston, Conn. on Saturday November 6, 2010. Weston QB #15 Joey Falci tries to tackle Stratford's QB Markey Desruisseaux. Football highlights between Stratford and Weston in Weston, Conn. on Saturday November 6, 2010. Weston's #22 Daniel Rogers. Football highlights between Stratford and Weston in Weston, Conn. on Saturday November 6, 2010. Football highlights between Stratford and Weston in Weston, Conn. on Saturday November 6, 2010. Weston #22 Daniel Rogers. Football highlights between Stratford and Weston in Weston, Conn. on Saturday November 6, 2010. Weston's #24 Eddie Hutchins. Football highlights between Stratford and Weston in Weston, Conn. on Saturday November 6, 2010. 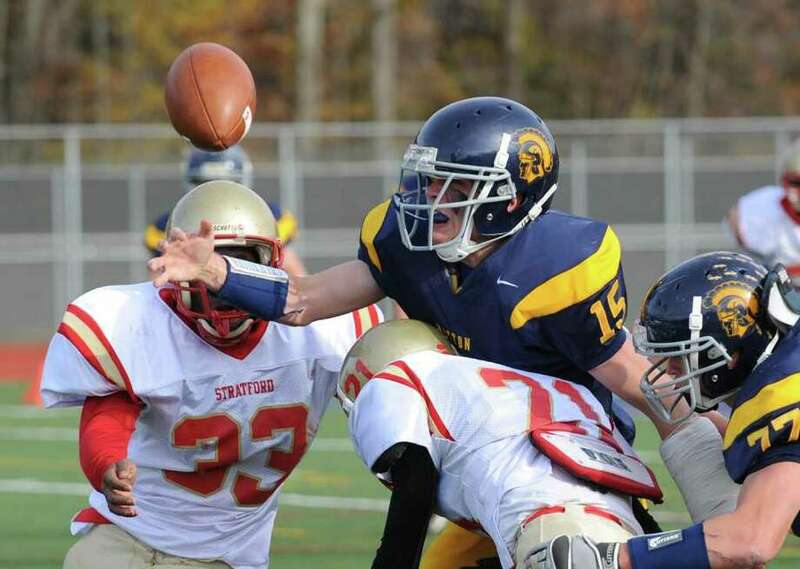 Weston QB #15 Joey Falci, left, passes the ball. Football highlights between Stratford and Weston in Weston, Conn. on Saturday November 6, 2010. Weston's #24 Eddie Hutchins, at right. Football highlights between Stratford and Weston in Weston, Conn. on Saturday November 6, 2010. Weston QB #15 Joey Falci. Football highlights between Stratford and Weston in Weston, Conn. on Saturday November 6, 2010. Weston QB #15 Joey Falci hands off the ball to teammate #24 Eddie Hutchins. Football highlights between Stratford and Weston in Weston, Conn. on Saturday November 6, 2010. Weston's #83 Matt keeney gets taken down by a Stratford player. Football highlights between Stratford and Weston in Weston, Conn. on Saturday November 6, 2010. Weston's #24 Eddie Hutchins tries to shake a Stratford player.